The Preservation Association of Central New York (PACNY) will hold the Annual Meeting of its members on Sunday, January 13, 2013 at 1:30 p.m. at St. Patrick’s Catholic Church, 216 North Lowell Street, Syracuse, New York. The meeting will take place in a one of Syracuse's notable religious structures, emphasizing the role these buildings play in our community, and also the diverse uses to which they can be put - in addition to religious service. In 2013, PACNY intends to highlight the special and often urgent needs of religious buildings. St. Patrick's on Tipp Hill, is a beautiful 19th-century Gothic-style structure and one of Syracuse's best-loved churches. The meeting will begin with a short concert of harp music played by Nancy Haney, including a program of Irish music in recognition of the venue. The program will be a mix of traditional Irish tunes and music composed by Ireland’s great itinerant harpist, Turlough O’Carolan (1670 - 1738). Harps are a special tradition in Syracuse - given that Melville Clark's Syracuse-made Irish Harps and other instruments were, for much of the 20th century, world famous. The business portion of the PACNY Annual Meeting will include a report on the affairs of PACNY by Board President Murray F. Gould. Members in good standing will then elect the Board of Directors to manage the affairs of the organization. Nine individuals, many of them new to the organization, have been nominated to fill out the Board. If not a member, this is a great time to join the organization. PACNY is an all-volunteer organization managed by its members. It has been the voice of historic preservation and a strong and often effective advocate for the sensible use (and reuse) of historic resources in Central New York for over 35 years. PACNY is pleased to have as its keynote speaker Jay DiLorenzo, President of the Preservation League of New York State, the statewide non-profit organization that serves to advocate and promote for the protection of our state’s vast historic resources. Over the years PACNY had received support from the Preservation League on several occasions including funds for research of the Freedom Trail and most recently a generous grant to survey the AME Zion churches in New York State. A reception will follow the meeting. This evening the City of Syracuse Planning Commission will hear an appeal by St. John the Baptist Roman Catholic Church on behalf of the Catholic Diocese of Syracuse to allow the removal of 22 century old stained glass windows from Holy Trinity Church, which was closed by the Diocese and merged with St. John in 2010. The intent is to sell the windows to a parish in Louisiana where they will be installed in a new church and that in some unspecified way that parish will then assist in the preservation of the Syracuse church building. These mostly address some errors in the Diocese application about the history and significance of the windows, and then mostly about the windows themselves. This is just a little bit about their significance; a book could be written about them. I only touch on the question of what actions have or have not been taken to save the church and the windows. Though I do have much to say on this topic, others at the hearing will no doubt address these issues. I urge my readers to attend the hearing at city hall tonight (weather permitting) at 6:00 p.m., and or to write their thoughts to the Commission ASAP at zoning@ci.syracuse.ny.us. Put "Holy Trinity Church: CA 12-01 A (appeal)" in the subject line. The windows are number 5 on a very full agenda. Thank you for considering the following remarks. I want to make it clear that I am sympathetic to the concerns and needs of the Catholic Diocese to protect and preserve Holy Trinity Church and its splendid windows – especially now in 2012 – during the building’s centennial year. The Diocese application is wrong in its dating of the building to 1891. Any cursory examination of historic literature makes clear that it was built between 1905 and 1912 and that the architect was Charles W. Eldridge (1882-1947). I have previously presented fuller material on the history of the church to the Landmarks Preservation Board and I will not repeat that here, since the Commission already recognizes its historic value. However, I will note that the dedicatory sermon was given at the church on February 19, 1912, though in such circumstances it was usual for some construction work to continue – in this case into the warmer months. It pains me, therefore, that at a time when other communities and congregations would use a building’s centennial as cause of celebration, planning and fund-raising, the Diocese is instead intent on its dismantling. Believe me – as I have 20 years of international experience working with congregations, and locally I was co-chair of the Building Centennial Committee at Temple Concord, dedicated in 1911. I am also on the Committee to save the former AME Zion church at 711 East Fayette Street, also built during these same exact years. I also want to make it absolutely clear that these windows, despite what is implied by the Diocese in its appeal, were indeed undoubtedly executed specifically for this church by the noted Buffalo-based Otto Andrle and his studio, and are among the finest in situ artworks in the City of Syracuse and among the finest stained glass window series in Central New York. Andrle clearly signed the windows in several places, including the on the first window to the left of the church entrance. Despite what the Diocese claims in its appeal, these windows are American-designed and American-made. They are certainly German in style, but are NOT imported from Germany. Even a casual examination of the great Parable windows in the nave at Holy Trinity Church suggests that the same process was employed in Syracuse. The desire to create large nave windows as separate but united and inter-related compositions was a relatively new and artistically mature development in American stained glass design, where previously and still for-the-most-part windows were purchased singly. Andrle’s narrative, iconographic and formal innovation was probably inspired but the increasing understanding through the late 19th century and early 20th century study of art history, of the working collective designs of great Italian wall decorations. For while the style of the windows is inspired by 19th-century German art, that art itself was influenced by the study – of figures and movement – of 15th and 16th century Italian art. These are not just church windows; these are important examples of innovative – but popular American art of the early 20th century. The choice of the nave window theme is significant, too. The representation of the Parables of Christ as the main decoration in a nave is unusual. In this case I think we can see it as a direct reflection on the needs, desires and behaviors of the Syracuse German Catholic community. The representation of the Parables teaches and inspires ethical, socially responsible and community building behaviors through the church; all values important to immigrant ethnic populations and especially promoted by religious and political reformers at the turn of the 20th century. Not surprisingly, the donors of most of these windows were German Catholic altruistic fraternal and other societies and orders. The more overt and traditional devotional imagery is placed closer to the sanctified altar and apse. In a broad sense then the windows reflect the division between observant laity and clergy. No window makes this clearer than the very original representation of the Tabernacle and the Temple linked here to the church. In some sense the quality of these windows provides a corrective to the somewhat skewed art historical emphasis on French-inspired American art of the time, and the search for incidents of incipient modernism. After all, the famous Armory Show that really introduced European abstract and other forms of modern art to America took place in 1913, probably just about the time these windows were being installed, marking them for the next generation of taste-makers, like so many of the great works of what we now call the American Renaissance period, as already old-fashioned not only in their religious subject, but also in artistic style. But today we can appreciate their beauty, and their virtuosity. Sending these windows out of state, would certainly preserve them in part, but would be a great cultural lose and opportunity to Syracuse – at a time when we as a community are trying hard to expand our cultural footprint. Removing the windows would almost certainly jeopardize the building aesthetically. Holy Trinity is designed as a German hall-style church. That means that all the aisles are the same height, so the aisle windows are actually the nave windows. Because the windows are huge, the use of stained glass lessens and softens bright light. And architecturally, these windows do more than that. The artist and architect chose Gothic detailing to frame the Renaissance-style narrative scenes – and thus expand the architectural space. The painted glass framing in the windows is meant to be seen as part of the architecture. Removal of the windows may also threaten the physical survival of the church. Their removal may make it difficult for a future owner to successfully obtain historic preservation tax credits, or obtain private foundation or other grants. Others will, I am sure, address the question of whether the diocese has done all that it can to manage the preservation of this historic building and its fine windows. I suspect not – since to my knowledge leading experts and organizations with experience in transitioning religious buildings were not, to my knowledge, consulted. While the building may have been listed for sale, it is well-established that selling an historic and artistic church is not the same as selling a house or commercial space. Listing is not enough. In a sense, one has to be creative, even to the point on inventing a purpose, rather than expecting a pre-existing purpose or user to find the building. These strategies exist, but they are admittedly hard work, time consuming and often slow. I urge the Planning Commission to deny the appeal of the Diocese to allow removal of the church windows. But I also urge the Commission take the word “planning” in its title seriously, and with city agencies – including those that tax – to take a more proactive and creative approach to the survival of this important religious, cultural, artistic and community resource. (n.b this is an edited and expanded version of a blogpost first uploaded Oct. 7, 2012). In my previous post I wrote about the now-forgotten Syracuse architect Howard T. Yates. As far as I can tell at this point, Yates reinvented himself after the Depression and world War II as a designer of sleek, jazzy geometric commercial spaces. 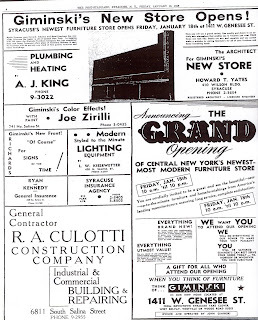 One surviving example of this work is the simple but still-striking former Giminski's furniture store, now The New Times newspaper building, situated at 1411-15 East Genesee Street. Since I've written a bit about modernism on the East Side of town, here is an introduction to the a fine modern building on the West Side. According to U.S. census data, Giminski born in Poland ca. 1889, and was living in Onondaga County by 1920. Michael Davis, a staff photographer at the New Times, informed me that Yates' jazzy facade is actually a remodeling on a previous building from which John Giminski ran his funeral home and a Polish dance banquet hall on the second floor. Michael says that parts of the original facade can still be seen from the newspaper's editor's office. When Giminski and Yates built the store it must have been striking - as it still is in some ways - with its flat geometric facade made of brick and glass bock, set slightly off balance with a vestigial tower on the west end, that serves as the support for a vertical sign. The glass block was illuminated by neon tube lighting which would have added drama and pizazz to the building at night (some of the original electrical work is also still in place, though inoperable). The economy of the design may have been imperative for a cost-conscious owner, but it may also have emphasized what was probably the modern style furniture offered within. The building raises expectations of the sleek and new. Yates was pioneering the large open street front windows which both helped light the store interior, but also allowed visual entry into the depths the store from passing automobiles, and from the moment of approach. This is entirely the opposite of many pre-war establishments, where store windows were set in heavy wood or metal frames, and were often encrusted with decoration. In this case, retail function, building economy and new popular taste were all in sync. The facade of the building remains in good condition, and if the wide horizontal band above the store windows were restored the building would a fine addition to Syracuse's (small) family of Deco, Art Moderne, and early Modern -style buildings. The ground floor retail spaces are still generous and could be attractive - for retail, and art gallery or a cafe. 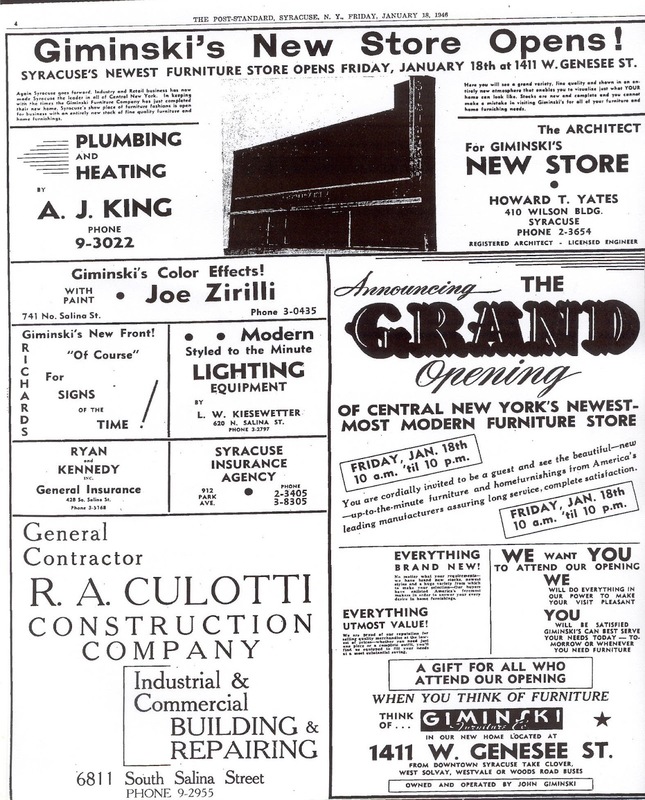 The building was later a Raymour Furniture store and then housed as M & R Carpets. If anyone has memories of the furniture store, or information about John Giminski, or further information about Howard Yates, please let me know. Much of this neighborhood was documented by Cornell historic preservation students in 2010. Read more here. I've also recently wrote about architect Howard Yates, who worked in the area. Scottholm is one of Syracuse's most beautiful neighborhoods. Laid out as a garden suburb and built between 1915 and about 1930 (with some later post-WWII additions including the landmark modern Skoler house) the landscaped streets lined with attractive 1920s houses - including Arts & Crafts, Tudor Revival and mission Style houses - are especially pretty this time of year. Join me on this free tour! If you have information about houses in the area - let me know. Many of these houses have only through a few owners and descendants of the first owners have not moved far. Here is an opportunity to explore Holland Street on the West Side, and to learn some pros and cons of city living. Holland Street, and nearby West Onondaga, boast many fine houses, but the urban fabric has been whittled away over past decades. Learn what some home owners have been doing to maintain the neighborhood and their fine late 19th-century homes. Tour participation is free but donations gratefully accepted. Please support PACNY by becoming a member to create a larger voice for preservation in Central New York. Membership forms will be available. The member-based Preservation Association of Central New York has been the area’s citizen voice for historic preservation for over 35 years. Founded as a reaction to the widespread neglect and demolition of historic buildings and neighborhoods in the 1960’s, PACNY has led the successful effort to transform our community’s perception and care of its historic resources so that now the City of Syracuse and Onondaga County now have more than a dozen historic districts which contribute to the region’s cultural and economic vitality. For further information about PACNY, see the PACNY website at http://pacny.net/.